Nearly thirty years since HIV/AIDS was first identified, confusion over effective mechanisms of controlling and eradicating the illness remain prevalent. This book highlights the need for comprehensive approaches to governance, as responses to HIV/AIDS become increasingly focused upon the health aspect of the epidemic, and financial commitments become subject to aid fatigue. This book examines the roles and influence of multiple actors and initiatives that have come to constitute the global response to the epidemic. It considers how these actors and structures of governance enhance, or limit, participation and accountability; and the impact this is having upon effective HIV/AIDS responses across the world. The book addresses participation and accountability as key elements of governance in four thematic areas: the role of the state and democratic governance; non-state actors and mechanisms of political governance; public-private partnerships and economic governance; and multilateral institutions and global governance. 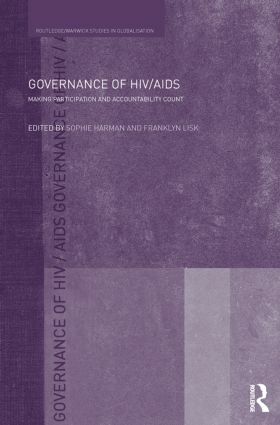 Drawing on the insights of public health specialists; political scientists; economists; lawyers; those working with community groups, and within international organisations, it offers valuable perspectives on the governance of HIV/AIDS. Aimed at both academics and practitioners throughout the world, this book contributes to the academic debate surrounding global governance, health and development economics, and the work of multiple international organisations and civil society organisations.